With a planned investment of USD 20 million in 1,500 acres of Codex-compliant productiona��to be set up across 16 locations in North, West, Central and South India over the next five yearsa��First Agro is hoping to change the way India buys and eats vegetables. The companya��s farm in Karnataka is spread across 45 acres of virgin soil.A� Managed by the foundersa��brothersA� NameetA� and Naveen Modekurti andA� cousin K N Prasada��it is a virtual island of the freshest organic produce and sends 30 tonnes of veggies to Bangalore every month, retailing under the First Agro brand. Among their regular clients are five-star hotels like the Ritz Carlton, restaurants like The Glasshouse and City Bar, and gourmet markets like Foodhall and Auchan. Deep purple okra, chillies in unimaginable colours and textures, lettuce leaves bursting with pungent flavour. The best part is you can eat anything straight off the plant because they grow zero-pesticide produce, in compliance with stringent WHOa��s Codex Alimentarius, the highest food safety standard worldwide. They have a pile of reports verifying that the produce has been independently tested and found to be zero-pesticidea��just in case anyone is interested. a�?Sadly the term CODEXA� means nothing to the average consumer. Even countries like Pakistan are ahead of us in Codex implementation,a�? he says. Nameet, a commercial pilot by profession, is the chief production head at First Agro. Also an expert in olericulture (science of vegetable growing), hydroponics and integrated pest management, he has pioneered the zero-pesticide cultivation method. Based out of Vancouver for many years, he used to operate red-eye flights,A� a�?I used to fly over vast tracts of farmland and I was fascinated by the sheer scale and depth of farming in these regions,a�? he says. This curiosity led to a discussion with his brothera��who used to head Hewlett Packarda��s Asia Pacific operationsa��and the idea to start First Agro took root. The brothers teamed up with Prasad, who had extensive experience in supply chain management and farming practices, and the trio began to produce a vast range of vegetables, many grown forthe first time in India. Nameet also believes in leaving organic footprints across the citya��fromA� Michelin-starred chef Anupam Banerjeea��s garden at The Ritz Carlton (bursting with exoticA� herbs), to the edible living wall he set up at Siddarth Poojary and Rohinton Motthaheda��s restaurant, The Glasshouse (where diners can have their food picked fresh off the plant and prepared by the chef). Nameet shows visitorsA� around the farm, stopping to crush a handful of fragrant Thai basil, pick a delicate courgette flower or inviting you to taste an heirloom tomato. a�?Heirlooms are grown from seed that has produced the same variety of tomato for at least 50 years. They blemish and spoil much quicker than factory-produced hybrid tomatoes, but they are prized for their flavour. Some, like the Cherokee Purple, have a sweet, rich, smoky tastea��perfect in a salsa, chopped up with a jalapeno pepper, onion,A� coriander, lemon juice and a dash of salt,a�? he enthuses, before moving on to a cluster of red Rubin basil with deep purple-red leaves and hints of bronze. a�?These make a lovely accent to salads or dressings and are also delicious in marinara sauces,a�? he tells us, a�?It adds a layer of complexity to a salad or even a cocktail. And dona��t even get me started on the health benefits of cholesterol-lowering ability of steamed red mustard leaves that grow so profusely here. I mostly add them raw into salads and allow their gentle pungency to take the other ingredients in an appealing direction,a�? he says. Meanwhile, Mottahed, one of the partners at The Glasshouse, is pleased at the way his chefs can get all their basic herb requirements for the restaurant on a daily basisa��clean, fresh and minus any contaminants. a�?Working with First Agro is always a pleasure. 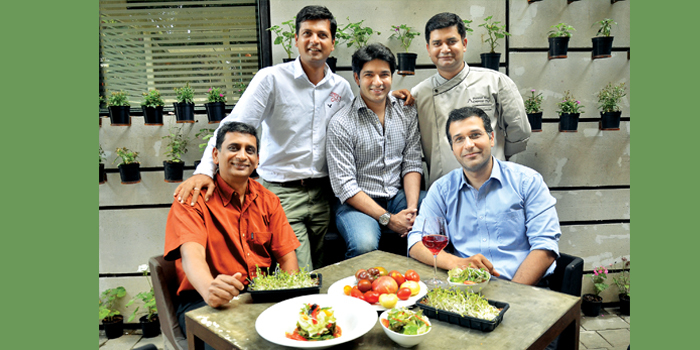 They understand the concept of farm to fork and team up with us to plan menus and grow produce accordingly,a�? he shares.